There are tons of bass lures out there, all promising great results, and demanding a place in your tackle box. But which types of﻿ lures are worth looking into? Which brands are industry leaders, and which type of lure will actually net you that gigantic bass you’ve been looking for? In this article, we’ll take you through the basics of bass fishing lure types, take a look at the best brands manufacturing those lures, and then give some specific product recommendations on best the best bass lures. Read along, and learn with us. Though there are tons of different lure types specifically intended for bass, these are the four basic lures you should be looking for. Despite all of the advances in bass fishing technology made over the years, it’s hard to beat the quality, versatility, and functionality of the classic rubber worm. These lures are appropriate for patient anglers who are willing to pay close attention to their rod, and they can be rigged up in tons of different ways depending on the situation. Crankbaits are very versatile, suited to most water conditions, due to the fact that they can cover a large amount of water in a very short time. However, care must be taken to select the proper crankbait for your application - they come in a huge variety of weights, shapes, and sizes. This is because, generally, you’ll be fishing in a straight retrieve, with most action coming while you reel in. Take care to vary your reeling motions, jerking and yanking your rod a bit to produce erratic motion, and produce more strikes. Spinnerbaits combine three very important traits into one lure - they attract bass very well, they cover large distances, and they’re relatively weedless, making them suitable for fishing even close to shore or large patches of weeds. 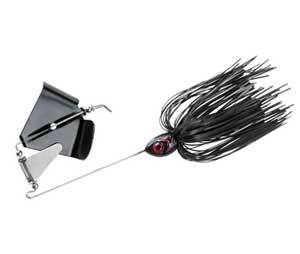 The shiny spinners on end flash and twist, attracting bass, and on the other side of the “safety-pin” design, there’s a variable-weight lead-head, as well as a sharp hook. Given the spinning action of the spinner, they’re generally retrieved straight and need very little jerking to produce strikes. These are the lures with the highest skill level on our list, but they create far too many strikes to be ignored. Jigs are fished at the bottom of the water, unlike our other selections, and must be carefully finessed to produce jerky, skipping motions along the bottom of the water to produce great results. 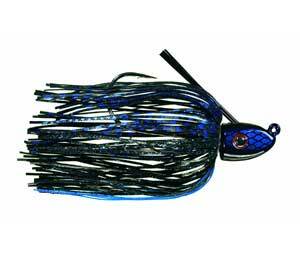 Bass also do take jigs when they’re on their way to the bottom, but primarily you’re going to be looking to get your jig on the bottom of the water, keep it there, and vary its action to attract fish. The two primary differences between jig styles have to do with sinking rates and the action it gives off on strike. There are different common styles, but the “arkie-head” style jig is the most versatile and widely used, and a good starting point if you’re interested in jigging. Yamamoto is the go-to industry leader when it comes to rubber worms, and with quality products like this 10-pack of Senko rubber worms, it’s not hard to understand why. This product’s simplicity is its strength. 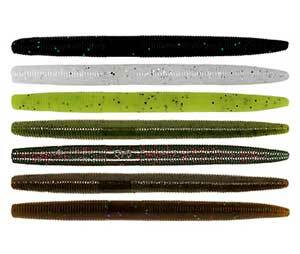 Available in tons of different colors, this thick plastic worm comes embedded with a salt formula that releases when it’s tossed into the water and slows its fall rate, which combines with its side-to-side action and tail motion to make it a very attractive lure for bass and other fish. It can be fished in tons of different rigs, including wacky-style, weightless, Texas-rigged, or Carolina rigged. It’s so versatile, and that unparalleled versatility makes it a favorite of both novice and experienced anglers everywhere. However, these lures should be thought of as disposable. The unfortunate side effect of their effectiveness and action is that they will be lost and eaten quite a bit, which, combined with their higher price point, should be taken into consideration. You will absolutely get incredible results, but those results do come at a price. If you don’t mind going through a couple boxes of this bait, you won’t be disappointed in the results - a cooler packed to the gills (sorry for the pun) with delicious bass. This cricket-shaped crankbait can also be used as a top lure, if desired, but it does excel at crankbaiting, especially when it comes to bass. This cricket/grasshopper-shaped lure can also attract perch and crappie and other small fish, and it’s also remarkably effective on bullfrogs! To use this specifically for bass, one user recommends the following process. 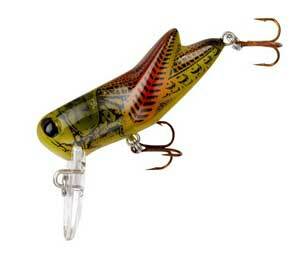 Cast this crankbait as far as you can, and wait a few moments. Take in almost all of your slack, whip your rod to the side for a quick jerk, then repeat to the other side. If you’ve not gotten a bite, begin reeling in until your line pulls above the surface - this causes the unique action of this crankbait to do a sort of “waddle” below the surface that drives fish nuts! You’ll want to to keep reeling it in, just fast enough to cause a ripple behind it. If you manage to reel it all the way back in without a bite, just repeat the process. It comes in quite a few colors, with the darker ones very suitable and visible for clear waters on bright days, and plenty of bright neon green and yellow colors for muddier, deeper waters. It’s recommended for use with a double-loop line knot and an 8-10lb test line, so it’s perfect for freshwater fishing for small bass and other game. 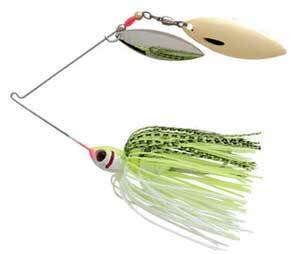 The Booyah Buzz Spinnerbait has a unique design, with a “clacker” that smacks against the rotating mirrored blade, creating both noise and flashing light to attract fish to the bait. A 55-strand silicone skirt covers a high-quality mustard ultra point hook, and this spinnerbait comes in weights including ¼ oz, ½ oz, and ⅜ oz, ensuring that you can have a variety of different weights for differently-sized fish. It also comes in a selection of bright colors for day fishing, as well as a pure white and pure black colors that are more useful during dawn and dusk. This spinnerbait differs from some others in that it’s intended to be used quite near to the surface, where its unique clacking action can attract the most fish. Because of this, it’s recommended for use when fish are already active - near dawn and dusk, when baitfish are active, and when the water is smooth, and you see that the fish are active. While you can easily fish at other times, this is when you’ll really have the best results, and reel ‘em in, one after another after another. It’s simple to use, as are most spinnerbaits. Cast it far and strong, and begin reeling in, slowly but consistently - not so fast that there’s no trail or sound, but not so fast that it’s skipping across or making tons of noise. You want a steady middle ground. Keep reeling in steady, and repeat if you don’t get a bite. It’ll take a little while to get a bite, but you will get very consistent results once you master the technique. If you don’t want to shell out for a more expensive spinnerbait such as the Booyah Buzz, you’ll still get good results with spinnerbaits like these that come in packs of 4-6 in varying sizes, colors, and styles. While the length varies on each of these spinnerbaits, they are all 0.62oz lures, so your action should still be quite consistent. They’re perfect for bass in the ~5lb range. These are a great choice if you’re just getting started using spinnerbait, and aren’t sure about how you’ll like it (or are worried you’ll lose an expensive lure and be stuck out on the water SOL). Though they’re not exceptionally durable, they’re a great deal for the price, and well worth your time to check out if you’re just getting into using spinnerbait. The Strike King Tour Grade is a top-grade jig bait, designed specifically to incorporate a streamlined, balanced head which provides unparalleled swimming action, along with a durable, fully painted and color co-ordinated Perfect Skirt which covers an ultra-sharp medium wire hook. It’s also designed to work well with craw-style trailer rigs and comes in both a 0.25oz and 0.375oz weight. The quality design ensures a snare-free, weed-free jigging experience, and when combined with an appropriate trailer, it mimics a baitfish incredibly well, delivering especially great results in the 12-15 ft depth range. It’s a great lure to use when it’s still cold outside, as you can lure in fish still lurking at the bottom of the water who are a bit more sluggish and inactive. Naturally, you’ll want to cast this jig quite far and allow it to settle for a bit until it sinks to the bottom. Then, begin jerking it a bit and draw it in slowly, allowing it to skip and skitter against the bottom, kicking up mud and attracting fish. It may be slow going at first, but once you get the hang of jigging, you’ll love adding this lure to your bass arsenal for those colder days when the fish at the top of the lake just don’t seem to be biting. Of course, there are far more lure types than we mention above, but given the quality and ease of use of the above lure types, they’re the best to get started with if you want to do some serious bass fishing. Once you’ve mastered these lures, you may consider a topwater lure like a popper, but we recommend mastering these basic bass lures first. 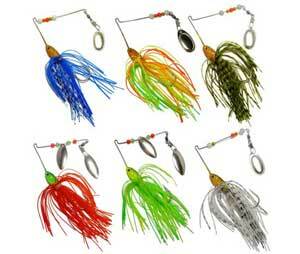 All suitable for mid-weight bass and other smaller fish, they’ll give you a great starting point. Fishing For Beginners – A Guide to Setting up Your First Fishing Experience!